The second metro service to be opened in Central Asia right after the Tashkent Metro of Uzbekistan, the Almaty Metro is a rapid/transit metro system running in the city of Almaty, Kazakhstan. After nearly two decades, the Almaty Metro service was opened to the public on the 1st of December, 2011. Presently, there is just one metro line spanning over a length of 11 kilometers, serving 9 stations. The Almaty Metro service has an annual ridership of about 6.56 million. If things go according to plan, the Almaty Metro service aims to be a vast metro service of approximately 45 kilometers in length. It is considered as one of the cleanest and most beautiful metro systems in the world, with marble floors and artworks adorning the walls of the stations. Map of Almaty Metro showing its lines and stations. Click on the map to enlarge it or Download Almaty Metro Map in PDF. The metro service is in operation between 6:00-00:00, midnight. Trains arrive every 10-15 minutes, thereby making travelling in these trains very convenient. A comprehensive service, it gains popularity with the masses because of its low cost. With just 80 Tenge, one can travel to any station, irrespective of the distance. A Yellow Token will be handed to you and that’s about it. It gets better for children below the ages of 7, as travel is free. Whereas, for children between the ages of 7-15, a red token can be secured for just 40 tenge. However, you need to show a mandatory birth certificate copy stamped by the institution or place of study. Frequent travellers have the option of purchasing a rechargeable card which gives them unlimited access to the metro service. The drawbacks of this card being, if once lost it is not replaceable and a small deposit has to be made while purchasing the card. 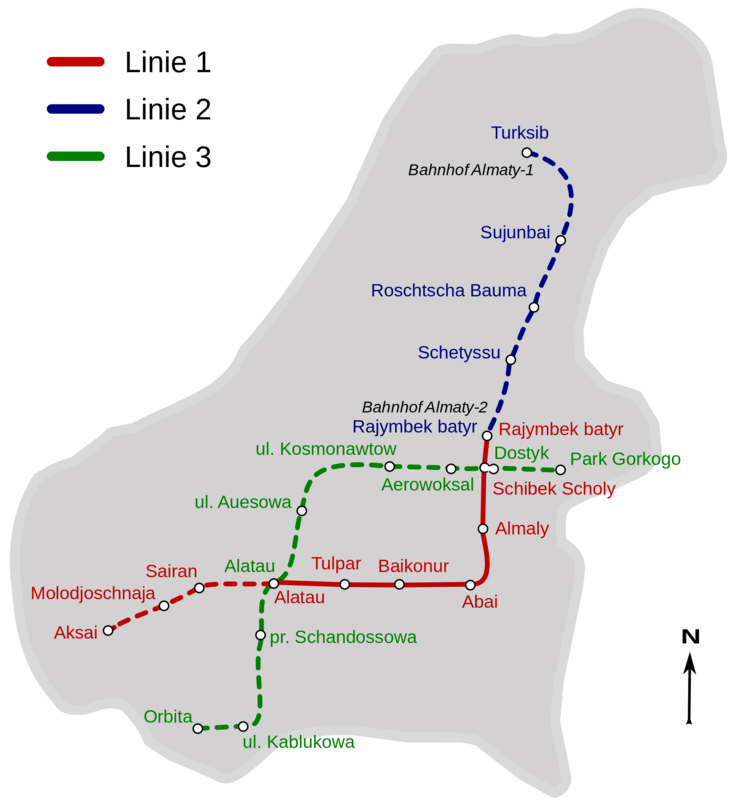 The one line metro system, begins in Raiymbek Batyr terminal. It then covers 8 more stations namely: Zhibek Zholy, Almaly, Abay, Baikonur, Auezov Theatre, Alatau, Sayran and Moskva.